Richard Jordan Gatling was born in Money’s Neck, North Carolina on September 12, 1818. The son of an inventor, by age 21 he had himself invented the screw propeller for steamboats, only to find it had been patented a few months before. 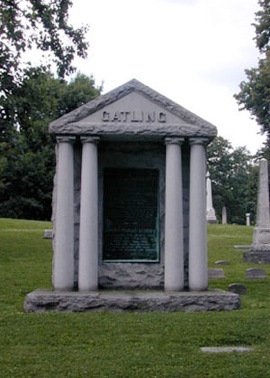 He became interested in medicine, and graduated from Ohio Medical College in 1850. Instead of practicing, however, he moved to Indianapolis in 1854 and took up inventing again without much success. As the Civil War broke out, he started to focus on developing new weapons, and in 1962 demonstrated the first working model of a 6-barrel gun, each barrel of which could be fired and reloaded in rapid succession by turning a crank. The device was the forerunner of the modern machine gun, and it revolutionized warfare. He secured the patent for the “Gatling Gun” on November 4, 1862. The Gatling Gun Company was founded in Indianapolis that year, where it remained until 1874 when he struck a deal with the Colt Patent and Firearms Company of Hartford, Connecticut to manufacture the device, now in great demand by the US Navy and Army for various purposes. 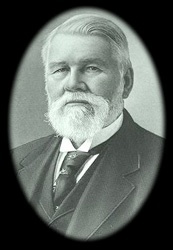 Gatling moved there with his family that year, and stayed until his company was officially merged with Colt in 1897, at which time he moved to New York City. Ironically the gun wasn’t ready in time to see much use during the Civil War – the reason he invented it in the first place. Accused of unleashing a terrible weapon on humanity, he maintained until his death that he always intended to have the device save the life of the user, and because of its terrible efficiency, make war itself obsolete. He kept improving the gun, later creating a ten-barrel version before the army declared his gun obsolete in 1911 after 45 years of service. 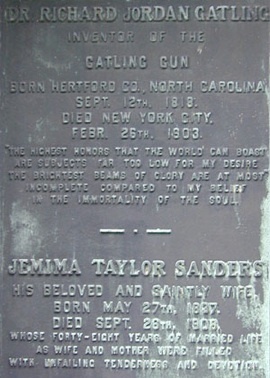 He died on February 26, 1903 in New York City. Due to bad real estate and railroad deals, he had only a fraction of his wealth remaining. Always considering Indiana his true home, he was buried in Crown Hill, section 3, lot 9, on the side of a gently sloping hill. No one will miss you jumping out of a window. I’ll hold it open for you. You fail to appreciate a great man you hoped his invention would end all wars forever this weapon being too terrible to face. What have you done for mankind b-a. According to his biographers, he died, in bed, in NYC, at the age of 84. Old age would be a safe bet.